This recipe came from a magazine I got while in college. I made it a few times that summer and then pretty much forgot about it. I don’t know what made me think of it the other day, but I decided I needed to make it again. I tore my office apart looking for that magazine, only to come up empty handed. And then it occurred to me that it’s 2014 and I could probably find it on the internet. Thank you, internet! This is a dish that looks fancy but is actually pretty quick and easy – and now that the recipe has resurfaced, I’m sure it’s one we’ll make regularly. If you’re still looking for something fun to grill up this weekend, I recommend these! Place bacon on a microwave-safe plate lined with paper towels. Cover with another paper towel and microwave on high for 2-3 minutes, until partially cooked. Butterfly the steak and open it so it lies flat. Pound out to 1/4″ thick. Cover with spinach and red peppers. Roll up, jelly-roll style. Wrap the bacon strips around the beef and secure with toothpicks or skewers. Slice between the bacon slices, making 8 pinwheels. Preheat the grill to medium heat. Grill for 5-7 minutes per side. While the pinwheels grill, combine cream cheese, milk, butter and pepper in a small saucepan over medium heat. Cook on low, whisking regularly, until smooth. Whisk in cheese and stir until melted. Serve pinwheels with cheese sauce. These look ah-mazing. 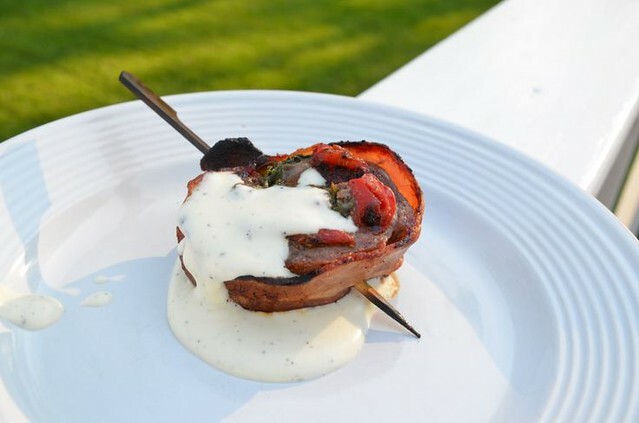 I love pinwheels, flank steak, and that cheese sauce; I have to try these!